Concord, North Carolina (April 19, 2018) – The youth movement throughout professional motorsports is alive and well in the ARCA Racing Series presented by Menards. On Sunday, top teenage driver prospects, Christian Eckes and Chandler Smith, take to the track in ARCA’s running of the Kentuckiana Ford Dealers 200 at famed Salem Speedway. Despite their ages, Smith, 15, and Eckes, 17, posse notable talent, maturity beyond their years and the threat to win every time they strap into the driver’s seat. Racing for Venturini Motorsports (VMS), both drivers are part of Toyota Racing’s prestigious TD2 program. At 17-years old Christian Eckes, the high school honor student, is entering his third partial season racing with VMS in the ARCA series. Eckes, driver of the No.15 JBL Audio Toyota, has made two previous starts at Salem Speedway – his best track performance came in last year’s spring race after leading 91-laps and finishing eighth. With an eye on making it to the top levels of NASCAR, Eckes, the 2016 Snowball Derby winner, has made a total of fifteen starts during his current series stay. Knocking on the door of claiming his first series victory, Eckes has two runner-up finishes to go along with four top-5 and 11 top-10 finishes. His 274-laps led in 2017 was a team high among all VMS drivers. Fifteen-year old standout and series newcomer Chandler Smith made a dramatic entrance in his first career ARCA start winning the General Tire Pole Award (track record) and finishing fifth two weeks ago at the Fairgrounds Speedway Nashville. Riding momentum, Smith, a native of Talking Rock, Ga. will strap back into his VMS prepared No.20 Smith General Contracting Toyota looking for more in Sunday’s showdown in Salem. “This will be my first start at Salem but I feel like I adapted quickly to the new track. It reminds me a lot of Winchester Speedway. The biggest difference in the two tracks is probably turn one – it’s harsher than Winchester and you can’t carry the same speed through the corners. Making his super late model debut at the age of 12, the now high school sophomore is no stranger to the spotlight. Despite his age, Smith has been regularly making headlines as he successfully makes his rise up through the ranks of stock car racing. After nearly winning last year at the Snowball Derby, All-American 400 and Winchester 400 the talented teen finally was able to break out earlier this year by capturing his first career super late model victory in the ARCA/CRA Super Series Powered by JEGS at Watermelon Capital Speedway. With a win at SpeedFest and two runner-up finishes at Greenville Pickens and Myrtle Beach, Smith is optimistic about continuing his streak at the next level. The Kentuckiana Ford Dealers 200 will spread out over two days, Saturday and Sunday, April 21-22. Practice is Saturday afternoon from 12 noon to 1:30 pm ET, with General Tire Pole Qualifying following at 4pm. Kentuckiana Ford Dealers 200 raceday festivities get underway Sunday morning with an on-track driver autograph session at 11:30am, followed by the Great American Stock feature event at 1pm. Pre-race ceremonies, ARCA driver introductions and the Kentuckiana Ford Dealers 200 follow. The ARCA race is scheduled to get the green flag at 2:15pm Sunday afternoon. Over the last 35-years Venturini Motorsports (VMS) has evolved into one of the most recognizable names in professional motorsports. Known for long-time dominance in the ARCA Racing Series presented by Menards, Venturini Motorsports is held in high regard as one of the premier NASCAR driver development programs in the county. 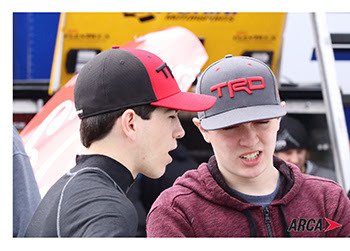 Since 2007, VMS has specialized in the career development of some of today’s top racing talent including current NASCAR “Stars” – Joey Logano, Erik Jones, William Byron, Alex Bowman, Ryan Blaney, Darryl ‘Bubba’ Wallace Jr., Daniel Suarez, Christopher Bell, Justin Allgaier, Noah Gragson, Ben Rhoads, Ryan Reed, Brandon Jones, Matt Tifft, Brennan Poole, Dalton Sargeant, Justin Haley and Todd Gilliland. Integrity, dedication and continuous innovation paired with years of on-track success has helped define Venturini Motorsports as one of the longest tenured teams in all of modern day racing. In 2012, the Venturini racing family was recognized for their collective achievements and inducted into the National Italian American Sports Hall of Fame – now finding themselves enshrined with such sports icons as Joe DiMaggio, Mario Andretti, Chip Ganassi, Andy Granatelli, Vince Lombardi, Tommy Lasorda and Rocky Marciano.